Exploring the central Florida Gulf Coast region around Crystal River and Homosassa guarantees some of the most unique and natural experiences you can still find in Florida. They call this part of The Sunshine State Florida's "Nature Coast", and once you visit it's easy to see why. Beautiful underground springs - many of which you can swim and play in on your own - occur naturally in the central Florida limestone shelf. Summertime is Florida scallop season when you can snorkel offshore for your own delicious bay scallops, and winter is Florida manatee season when the Gulf of Mexico temps can dip below freezing, driving the manatees into the warm 72 degree crystal springs to stay warm. Visitors flock to the area for manatee tours to swim with the manatees as they make their way into the springs. Whether you come for the scalloping, fresh seafood, to swim with manatees, paddle its scenic waterways, or cycle the Withlacoochee Trail, you'll want a great place to stay that the whole family will love. There are many nice places to stay in Citrus County from retro family motels to upscale resorts, but if you're wondering where to stay in Crystal River, FL or looking for hotels near Three Sisters Springs, it's hard to beat the Crystal Blue Lagoon Bed & Breakfast for it's unique personality. Staying here might just be as much fun as the water activities you'll enjoy just outside your door! The Crystal Springs Lagoon B&B, a spacious 4-bedroom, 4-bath home, sits directly on Hunter Springs Run off scenic King's Bay. While it has a secluded feel, it's walking distance from some great shops and restaurants in Crystal River. Tucked away from passing speedboats and fishing boats on the water, your morning view will instead include kayakers peacefully paddling by or pontoon boats quietly searching the inlet for manatees. The first floor living area features a large, well-stocked kitchen, several comfortable seating and dining areas, and a non-working fireplace beautifully lit with flickering candles and luminaria - all surrounded by large floor-to-ceiling glass windows which overlook a private lagoon, the conversational fire pit with 8 adirondack chairs, and a gorgeous water view of Hunter Springs Run. Most striking about the property however, is the interior and exterior decor, ranging from fun ‘Island Time’ motivational reminders to original artwork on the walls and floor by the owner as well as a local artist. 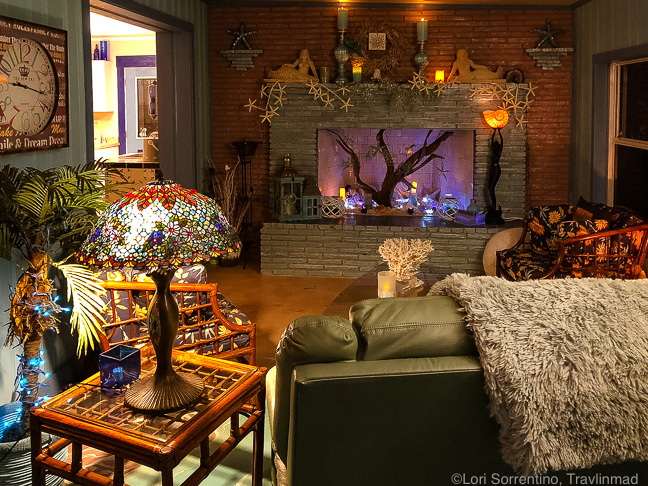 The ultra modern and wicker furniture blends comfortably with overstuffed recliners and patio loungers, and at night the entire scene is backlit with candles, twinkle lights and other glowing accessories that lends a surreal, magical feel to the entire house. We loved so many things about the Crystal Blue Lagoon: the location was terrific, close to some really good restaurants and Suncoast Highway, which made exploring the area so much easier. It's a short paddle to Hunter Springs Park and Three Sisters Springs. We also appreciated the strong Wi-Fi, and the beautiful views around the property especially from the rooftop deck that has plenty of seating and lounging. And the Temperpedic mattress in our room made for a heavenly night's sleep! We always love when a B&B includes some nice extras for guests, and the Crystal Blue Lagoon takes that to another level, with complimentary bicycles and kayaks to explore the neighborhood. And once you see what's waiting for you in the private lagoon at the side of the house, you'll be grabbing the kayaks as soon as you drop your suitcase! A mother and baby manatee greeted us first thing in the morning as they lazed in the lagoon - and we visited in the middle of the summer! The lagoon is fed by a private spring so you're almost guaranteed manatee sightings during winter manatee season when the spring water remains a constant 72 degrees - warm and protective for the manatees. Your stay at the Crystal Blue Lagoon includes breakfast, which is waiting for you whenever you like in the fridge or on the counter. The fridge was packed with five kinds of fresh fruit and various soft drinks, juices, and chocolate milk. For breakfast, there were frozen Eggo waffles, potato puffs, protein and granola bars, and fresh pastries and donuts. You could prepare your own eggs any way you wanted them, and there were plenty of coffee pods and creamer. But the goodies weren't just for breakfast: there were several bottles of wine and other spirits for a relaxing (or lively) nightcap or two! And if you're a late-night snacker, there was plenty to choose from. We loved being a kid-in-a-candy-store when it came to their generously well-stocked kitchen! But perhaps what we loved the most was discovering all the quirky and fun original artwork and decor inside the house and outdoors as well. Everywhere you look is a feast for the eyes with lagoon- and mermaid-themed artwork throughout. It was a perfect compliment to the natural setting outside, and if you can imagine, was even prettier at night. The Crystal Blue Lagoon B&B may be the closest thing you'll find to living inside your own private lagoon. With all the wonderful amenities at this property, there were a few factors we felt could be improved upon. Since this was a working trip for us, we found the lack of outlets in our room to be somewhat challenging. Also the upstairs door to the rooftop deck was nearly impossible to open and needs to be fixed, in case of an emergency and getting both in or out of the house. The property does not have a pool, but we didn't feel this was a drawback at all - even if we had children along. There is plenty to keep kids occupied and exploring for days, and other ways to have fun near or on the water. Parking is limited at the Crystal Blue Lagoon, but adequate for the number of guest rooms they have. Additional guests may have to park along the road. Overall, we enjoyed our short stay at the Crystal Blue Lagoon, and would certainly choose to stay there again with more time to explore the region. It's a perfect stay for large and extended families, girlfriend getaways, and multi-family gatherings. 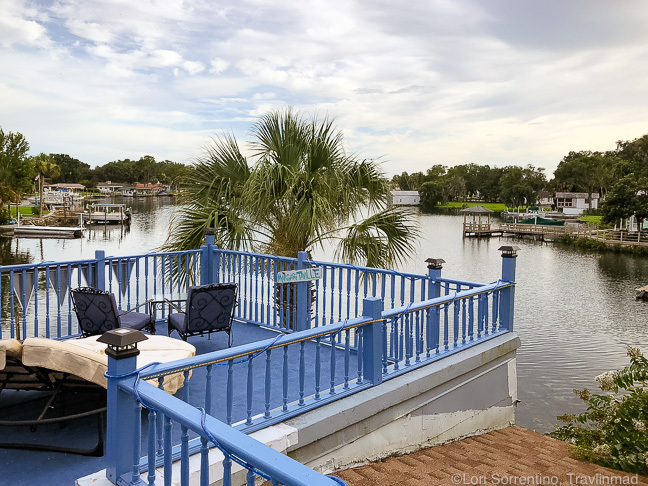 The service from staff and amenities were very good, and we loved the privacy at night and having the house to ourselves...time to sip our wine, watch the manatees swim by, and enjoy our own private lagoon! Crystal Blue Lagoon Bed & Breakfast, 244 NE 2nd Ct, Crystal River, Florida.